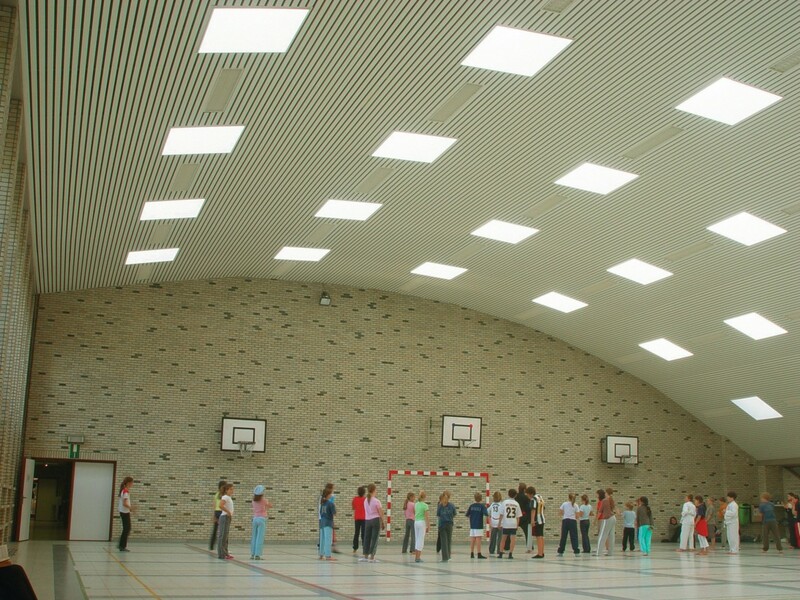 Hunter Douglas Architectural have extended their range of Sports Hall Ceiling systems, by developing a choice of robust ceiling applications that are tailor made for such demanding environments. These additional finishes include an extended range of wood species, veneered wood, aluminium, steel and square edge designed mesh panels. 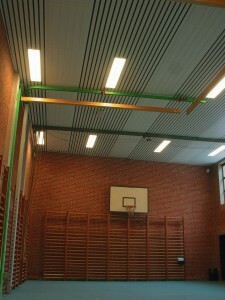 The traditional wood and metal linear ceiling systems are tested and certified to the highest standards for sports halls and swimming pools. They meet all of the requirements set out in the Din 18032 pt 3 standard for ball impact resistance, feature a reinforced carrier system and can be supplied with increased sound absorbing capabilities. The metal linear and mesh panel designs offer a reduced static load while the wood veneer, lightweight aluminium and steel systems offer easy access to the plenum. All systems are fully compatible with industry standard lighting, HVAC, speaker, fire safety and security services. Designers are encouraged to check out Hunter Douglas Architectural’s extensive range of colours and finishes and in particular their custom colour matching service available for both veneered wood and metal application. For more information on Hunter Douglas ceilings, please visit the website.